All delicious, all so clever. 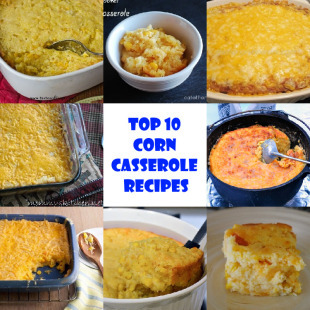 Here is the best Corn Casserole Recipes.. 1. Corn Casserole by Paula Deen Paula Deen Recipe Here 2. Slow Cooker Corn Casserole by eatathomecooks eatathomecooks Recipe Here 3. Corn Casserole with Bacon by givinguponperfect givinguponperfect Recipe Here 4. Easy Corn Casserole by crystalandcomp crystalandcomp Recipe Here 5. 5 Ingredient Corn ..
1. Potato Casserole by homemadecravings homemadecravings Recipe Here 2. Skinny Potato Casserole by sixsistersstuff sixsistersstuff Recipe Here 3. 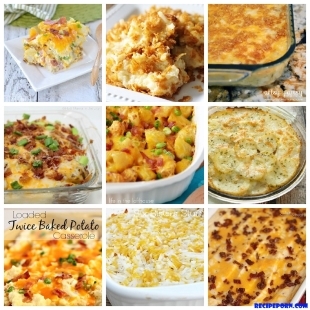 Twice Baked Potato Casserole by julieseatsandtreats julieseatsandtreats Recipe Here 4. Baked Potato Casserole by hottmamainthecity hottmamainthecity Recipe Here 5. Twice Baked Potato Casserole by momontimeout momontimeout Recipe Here 6. 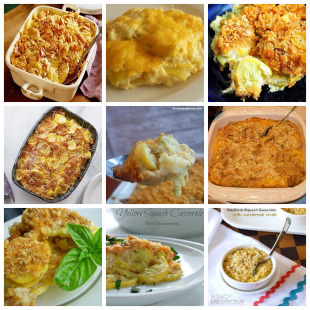 Cheesy Potato Casserole by chef-in-training chef-in-training Recipe ..
1. Chicken (or Turkey!) Enchilada Casserole with Green Sauce by mylifeasrobinswife mylifeasrobinswife Recipe of Chicken (or Turkey!) Enchilada Casserole with Green Sauce Here 2. Chicken Enchilada Casserole by handletheheat handletheheat Recipe Here 3. White Chicken Enchilada Casserole by paperdaisykitchen paperdaisykitchen Recipe Here 4. 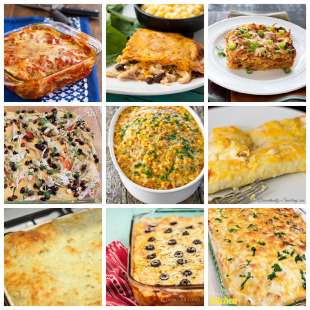 Rotisserie Chicken Enchilada Casserole by onegoodthingbyjillee onegoodthingbyjillee Recipe Here 5. Creamy White ..
1. Worlds Best Squash Casserole by crazyhorsesghost crazyhorsesghost Recipe Here 2. Squash Casserole by stockpilingmoms stockpilingmoms Recipe Here 3. Cheesy Squash Casserole by Paula Deen foodnetwork.com Recipe Here 4.Squash Casserole Recipe by addapinch addapinch Recipe Here 5. Low Carb Squash Casserole by food.com food.com Recipe Here 6. Cheesy Spaghetti Squash Casserole by familyfreshmeals familyfreshmeals.com Recipe ..